President Donald Trump’s attack on the LGBTQ community started in February when his administration rescinded protections for the transgender youth community. 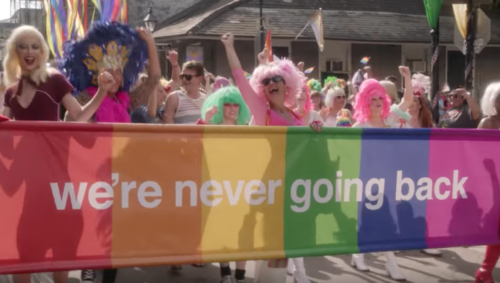 The city of New Orleans is pushing back in a way only New Orleans can: by throwing a parade! New Orleans Tourism gathered hundreds of people gathered on Bourbon Street in the French Quarter for a “reverse parade” during Mardi Gras. The tourism department wants to show that New Orleans is a city that welcomes everyone and where y’all truly does mean all. The video features people of all ages, races, genders, and orientations and is more than just another travel commercial. It represents that despite the current political climate created by the Trump Administration, the LGBTQ community says “we’re never going back.” The LGBTQ community is committed to making sure the the advancements made in LGBTQ rights under the Obama administration are here to stay!